"Send unlimited emails in one click with this email tool"
Vallen e-Mailer is a neat tool that allows you to send a large quantity of emails in a single click. It will also allow you to attach files, insert pictures, manage HTML, sever authentication SMTP and it's easy and practical its use. 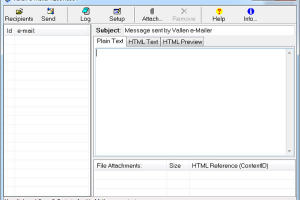 Vallen e-Mailer is useful for those businesses that email news or bills to their clients. It saves time and makes sure that your information is sent to your contacts. Hotmail or Outlook has a limit of 50 emails per click, but by downloading this software you will not have a limit and you can send as many as you want. Its interface allows you to add recipients in clicks, add logs and it also have a help button for your questions. It allows the use of copy and paste and also support HTML text. Before you send your HTML file, click on the HTML preview tab to see how it will look to your contacts.